Lens tubes are ideal for creating compact optical subassemblies with light-tight beam paths. The Ø1" lens tubes sold here can be used to house one or several optical elements, as shown in the diagram of a beam expander below. In addition to the Ø1" lens tubes featured on this page, Thorlabs also offers Ø1/2", Ø30 mm, Ø2", and Ø3" versions, each of which is equipped with an SM series thread standard that depends on the tube diameter. Optics are separated and secured by retaining rings that are positioned along the length of the lens tube using a compatible SM1 spanner wrench, sold below. Each of the lens tubes on this page come with one or two compatible SM-threaded retaining rings with the exception of the internally unthreaded lens tube spacers (Item #s beginning with SM1M). In addition, Thorlabs offers stress-free and plastic retaining rings for optics which require reduced stress on our SM-Threaded Retaining Rings page. 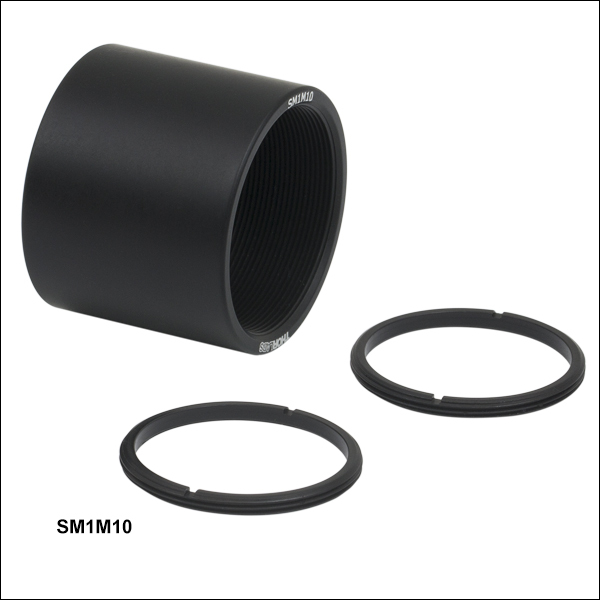 Would it be possible you offer your SM1Lxx and SM1Mxx tubes without the retaining ring? The ring is mainly useful when an optical element is to be inserted in the tube, but in several optical assemblies the ring isn't used: after several years of using these tubes for various optical assemblies, we have accumulated more than a dozen of these rings for which we have no use. At USD4.50 the ring, it would be a welcome cost reduction to be able to order the tubes without the ring. Hello, thank you for your feedback. We do have the ability to sell these lens tube separately, however, these will be offered as "special" items through Tech Support (and have to go through a special quoting process that can incur a 1-2 day lead time). Due to the additional processing involved, the price of the tube without the retaining ring is nearly the same as that of the standard bundle with the retaining ring included. Given that you're not using retaining rings with your lens tubes, it's possible that one of our Ø1" Lens Tube Spacers Without Internal Threads may be suitable (they come without retaining rings). I will reach out to you directly with more information. I would like to suggest creation of a new product for 0.5" thick optics without so much excess as using the 1 inch long tube: SM1L075 for a tube with thread depths of either 0.75". Thanks! Hello, thank you for contacting Thorlabs. We can likely offer this as a custom if you reach out to us at TechSupport@Thorlabs.com. I will also post it in our internal engineering forum. Response from Bweh at Thorlabs USA: Yes the thread is not complete but it will not cause free rotation. The un-threaded space on the SM1S10 is 0.38mm while the threaded region of the CM1-DCH is about 2.03mm so you should still have at least 2 threads that will lock the two together. Hello, 1.5" long tubes would be much welcomed, I have a 1" thick lens element which doesn't fit in your 1" tubes but 2" is too long for my setup! Could you offer these in both SM1Lxx and SM1Mxx line? Response from Bweh at Thorlabs USA: Thanks for your feedback. We can offer this to you as a special item for now. I will follow up by email. We will review this as a possible expansion to the lens tube stock product line. I'd like to see an extension tube like this made available for the SM30 line, and I'd also like to see a 12" length of this in the SM1 and SM30 for really long builds. Response from Bweh at Thorlabs USA: We can provide this to you as a special item if needed. For now, you could use various combinations of the SM30 lens tubes to achieve your desired length or two SM1E60 of the SM1 extension. A response from Sean at Thorlabs: Thank you again for your feedback on our lens tube covers. Several of our engineers have had sucess cutting the SC1L24 covers with a band saw or a coping saw. We have added this information to the website as a suggestion to future customers. In addition, one of our engineers tried using a pipe cutter and unfortunately, the tube was crushed. Response from Tim at Thorlabs: One of our target specifications for this product was for it to be easy to cut. We are grateful to hear your feedback on this so we can improve the design. I am talking to our engineers to see if we can offer this with reduced thickness or if we can provide a tool for clean cutting. Thank you for your feedback! The SC1L24 lens tube cover requires a power tool to cut, can you please consider adding a thin tube that could be cut more easily. Alternatively, provide some sort of jig that would allow the tube to be cut, i'm thinking a pipe cutter like gizmo. Thanks for listening, you guys are great! I see below that you have emailed the details of the SM1 thread form to others, can you please send me the details of this and the SM05, as I am designing parts to mate with them? Thanks. Customer Email: jon.hackett@ametek.co.uk This customer would like to be contacted. Response from Javier at Thorlabs to nkad: Thank you very much for contacting us. 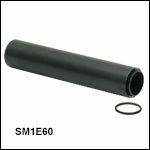 We offer a few SM1 couplers which consist of external SM1 threads throughout the entire length of the tube. However, keep in mind that the internal diameter of these couplers is 24.0 mm, as it is not possible to have a tube with both internal and external SM1 threads along the section of the tube. 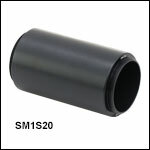 Please take a look at the following link for our SM1 couplers with external threads and our adjustable lens tubes: SM1 lens tube couplers with external threads: http://www.thorlabs.com/NewGroupPage9.cfm?ObjectGroup_ID=2704 Adjustable SM1 lens tubes: http://www.thorlabs.com/NewGroupPage9.cfm?ObjectGroup_ID=4109 I will contact you directly to get a better understanding of your application. 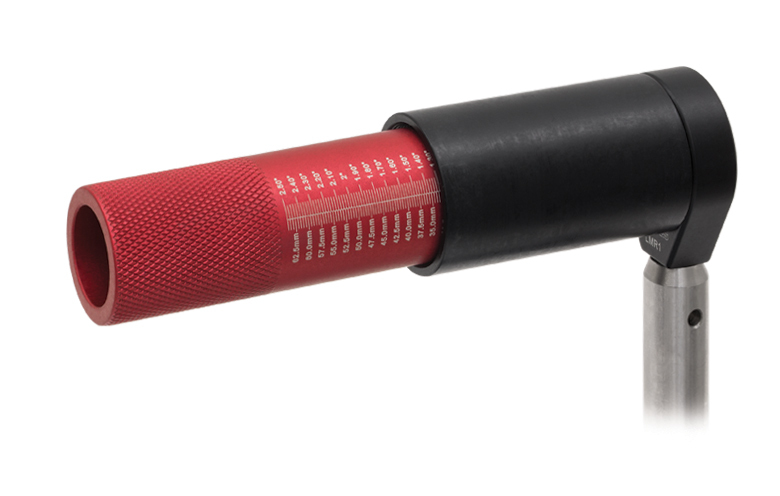 Do you have an SM1 tube with external threads along the whole length of the tube? This would permit infinite length adjustment for optics fixed at one end, especially when coupled with Lens Tubes Without External Threads. Customer Email: nkad@essex.ac.uk This customer would like to be contacted. A response from Greg at Thorlabs to mr.keith: Thank you for contacting us! I have e-mailed you the specifications of our SM1 threading. Response from Javier at Thorlabs to driall: I will send you an e-mail with the complete specifications for the SM1 thread shortly. These stackable Ø1" lens tubes provide a fast and easy means for building compact optical assemblies. Their stackable design and direct interfacing with any SM1-threaded (1.035"-40) components provide flexibility for complex optomechanical assemblies. 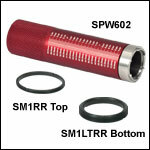 One SM1RR Retaining Ring is included with each lens tube. For convenience, four of our most popular SM1 lens tube sizes are also available in packs of 5. Each pack of 5 includes one retaining ring per lens tube for a total of five rings. Unlike our Ø1" stackable lens tubes featured above, these internally threaded lens tubes do not feature a lip at one end nor do they have external SM1 threading. Therefore, optics housed inside can be accessed from both ends. To join these lens tubes end-to-end, use a Lens Tube Coupler. 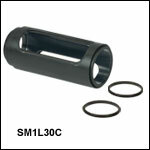 Two SM1RR Retaining Rings are included with each lens tube. These lens tubes feature internal SM1 threading on one end and a retaining lip for holding optics on the other. They allow optics to be quickly added to any externally SM1-threaded components. The SM1L05E is 1/2" (12.7 mm) long and can hold optics up to 0.3" (8 mm) thick, while the SM1L10E is 1" (25.4 mm) long and can hold optics up to 0.8" (20 mm) thick. Each segment includes an SM1RR retaining ring for securing the optic into place. The retaining ring provides a clear aperture of Ø0.90" (Ø22.9 mm) through the lens tube. These lens tubes are engraved with their respective part number at the end, as shown in the image to the left. This engraving is hidden when the lens tubes are combined with other SM1-threaded components. These Lens Tube Spacers are designed to connect two components with internal SM1 threads at a fixed distance. They are internally unthreaded and have a clear aperture of Ø0.95" (Ø24.0 mm). Please note that due to the fixed thread depth of 0.12" (3.0 mm), the orientation of the attached components will be arbitrary. For full control over the component orientation, Thorlabs offers Lens Tube Couplers with adjustable locking rings. The dust cover can be opened or closed by rotating it in either direction. 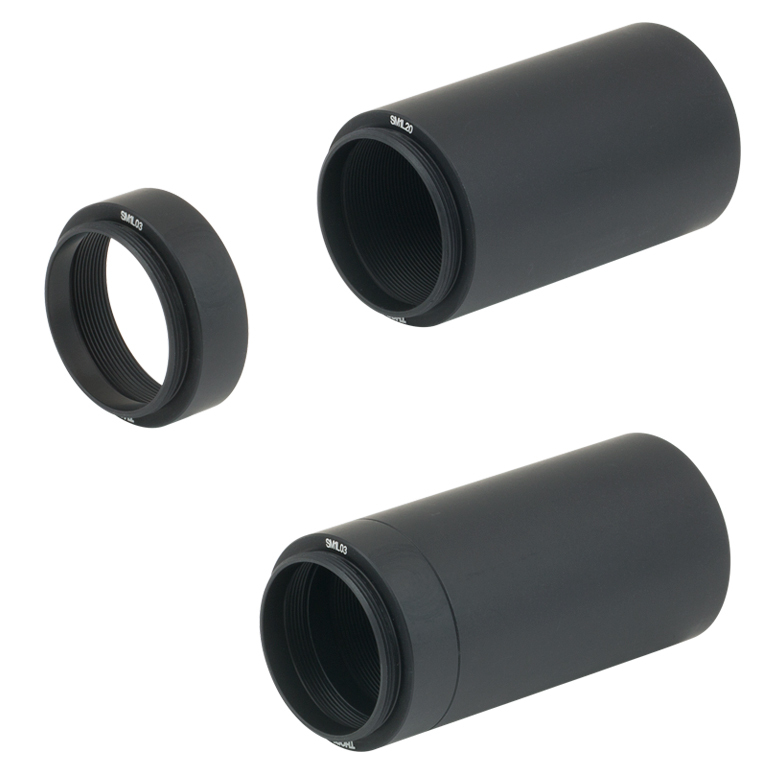 These stackable Ø1" lens tubes with side slots provide a fast and easy means for building complex optical assemblies and adjusting the optics without disassembling the setup. 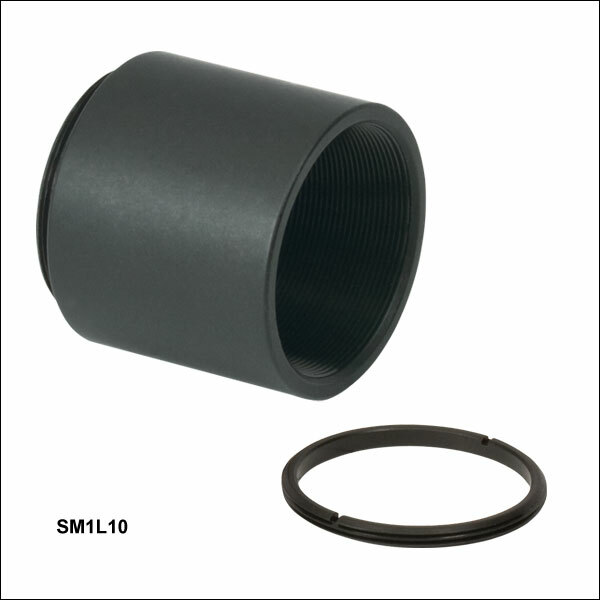 Optics can be inserted into the tube and locked into position using the included SM1RR retaining rings. Simply thread the first retaining ring to the desired depth, add the optic, and then use a second retaining ring to secure the optic. Optics can be manually adjusted via the side slots without the use of a spanner wrench. The rotatable slip shield included with the lens tube has an inner diameter of 1.21" (31.0 mm) and fits over the lens tube slots to prevent unwanted light from entering the system and to keep the optical setup free from debris. 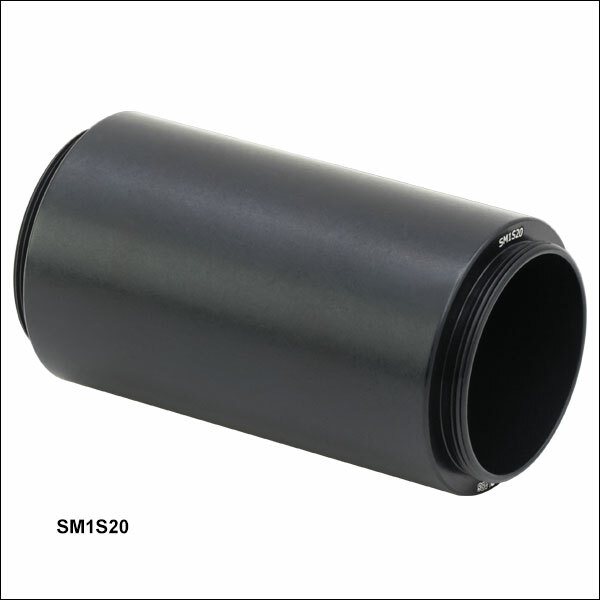 The SM1E60 6" Long Extension Tube is designed to enable longer distances between optical components in lens tube systems that utilize lenses with large focal lengths. This tube features thicker walls than our standard lens tubes while maintaining the same outer diameter, which leads to greater rigidity. Thorlabs offers five different kinds of SM1 (1.035"-40) retaining rings. 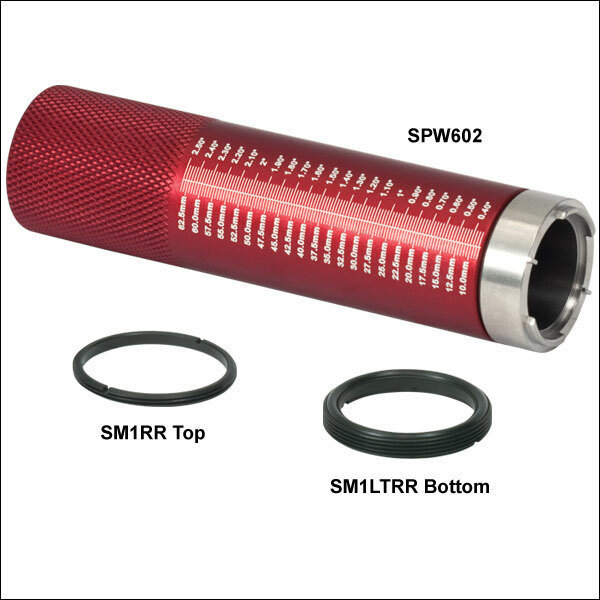 The SM1RR is our standard aluminum retaining ring that ships with our Ø1" lens tubes as well as many other Thorlabs components, and is available individually and in packs of 10. Additionally, SM1RR Retaining Rings can be swapped out for one of the SM1-threaded retaining rings listed in the table to the right. 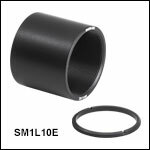 Please keep in mind that due to the increased thickness of some retaining rings, the maximum optic thickness that can be housed inside our standard SM1-compatible mounts will be diminished in some cases. Thorlabs also offers several spanner wrench choices. 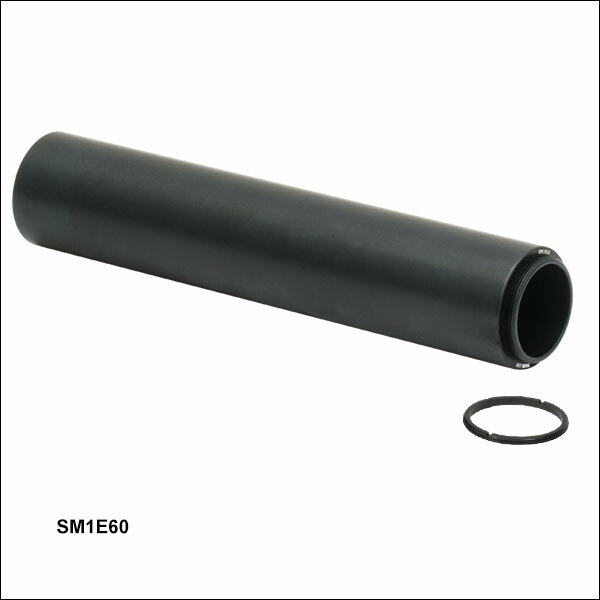 The 1" long SPW606 and the 3.87" long SPW602 can be used with the SM1RR and SM1LTRR retaining rings, while the adjustable SPW801 can be used with all three types of SM1 retaining rings. These spanner wrenches can be inserted into the lens tube, as shown to the right, and are hollow to prevent obstruction of the beam path. We also offer the SPB1 Spanner Bit, which can be used with a standard 1/4" hex driver (sold separately). The SPB1 is included as part of the SPB600 Spanner Wrench Bit Kit.